Here at GeekTech, we’ve seen some pretty fancy casemods, but how about one packed in a simple plastic container? 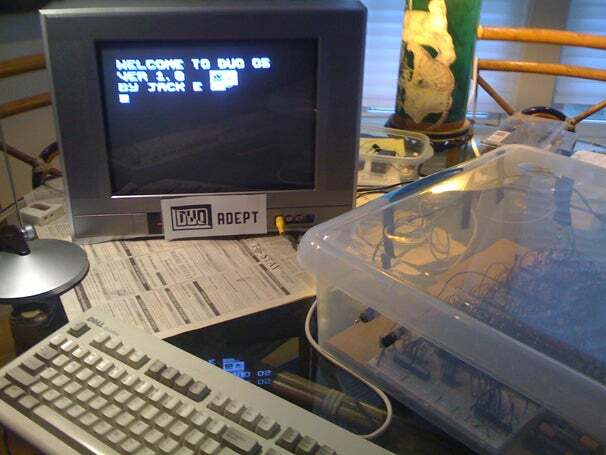 Jack Eisenmann, a recent high school graduate programmer, built this 8-bit TTL computer from scratch using a ton of chips, an old keyboard, and a semi-new CRT TV. The computer called the DUO Adept runs off a simple transistor-transistor logic architecture built from 100 chips on a breadboard and strung together by a mess of wires. The system has 64-kilobytes of memory and outputs a 240 × 208 black-and-white image. Eisenmann programed the DUO Adept with basic hex editor and taught his system to count to a googol (aka 10100). It can also play some 8-bit games like Pong, Conway’s game of life, and a Megaman-esque game called Muffin.